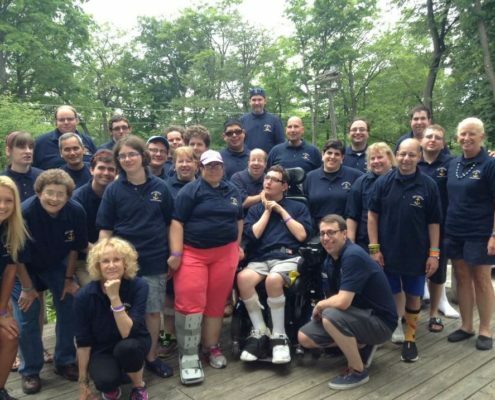 The Seabees Leadership Program is a one week program for former campers 20 years old and up who have limitations due to their disease or treatment. Guided by facilitators, this program focuses on personal growth through achievement and service to the camp. Program members participate in all camp activities and have an important role in aiding the counselors and leading the campers. They have hosted dinner parties for other camp groups, operated Casino Night, created a memorial rock garden and planned days of special fun for younger campers. The Seabees Leadership Program allows former campers to stay involved with their camp, maintain friendships and give back to camp and the campers. Acting as role models and mentors to the younger campers while at camp, Seabees also continue their involvement throughout the year by volunteering at fundraising events and assisting with administration projects.